McDougall, Robert L.. "Duncan Campbell Scott". The Canadian Encyclopedia, 10 September 2018, Historica Canada. https://www.thecanadianencyclopedia.ca/en/article/duncan-campbell-scott. Accessed 18 April 2019. 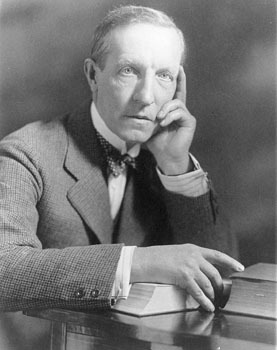 Duncan Campbell Scott, poet, writer, civil servant (born 2 August 1862 in Ottawa, ON; died 19 December 1947 in Ottawa, ON). Scott’s complicated legacy encompasses both his work as an acclaimed poet and his role as a controversial public servant. Considered one of the “poets of the Confederation” — a group of English-language poets whose work laid the foundations for a tradition of Canadian poetry — his intense works made use of precise imagery and transitioned smoothly between traditional and modern styles. However, his literary work has arguably been overshadowed by his role as the deputy superintendent of the Department of Indian Affairs. He enforced and expanded residential schools, failed to respond to a tuberculosis epidemic and oversaw a treaty process that many claim robbed Indigenous peoples of land and rights. His oft-quoted goal to “get rid of the Indian problem” became, for many, characteristic of the federal government’s treatment of Indigenous peoples. Duncan Campbell Scott was the son of Janet Scott (née McCallum) and Methodist preacher, William Scott. Educated in Smiths Falls, Ontario, he later went on to attend junior college in Stanstead, Québec. Scott’s family could not financially support his dream of becoming a doctor. Instead, through his political contacts, Scott’s father was able to get his son a job with the federal Department of Indian Affairs (now Indigenous and Northern Affairs Canada). At age 17, he was appointed copy clerk. Scott’s circle of friends included various prominent painters, such as Edmund Morris, Lawren Harris and Clarence Gagnon. Scott’s In the Village of Viger (1896) is a collection of short stories focusing on life in a rural French-Canadian village. Two later collections, The Witching of Elspie (1923) and The Circle of Affection (1947), contain many short stories in wilderness settings. For the Makers of Canada (a series of books designed to present Canadian history through a study of its major figures), Scott wrote a biography of John Graves Simcoe in 1905. In 1947, he published a book on artist Walter J. Phillips. Scott also wrote a work of fiction around 1905 that did not go to press until 1979, under the title The Untitled Novel. Published in 2001, The Uncollected Short Stories of Duncan Campbell Scott brings together his short fiction. He also wrote plays, including Pierre (produced in 1921), Prologue (1923) and Joy! Joy! Joy! (1927). Scott edited many of Archibald Lampman’s poems after Lampman’s death in 1899 in two collections: The Poems of Archibald Lampman (1900) and Lyrics of the Earth: Poems and Ballads (1925). A close friend and fellow poet, it was Lampman who had encouraged Scott to try writing poetry in the 1880s. Although he complained that his works were neglected by fellow poets, Scott has been well represented in many major anthologies of Canadian poetry. Indeed, Scott is commonly placed with the “poets of the Confederation” — a group of late 19th century English-language poets born in the decade of Confederation, and whose work lay firm foundations for a tradition of Canadian poetry. However, Scott’s literary representations of First Nations peoples in his poetry and fiction has generated considerable critical controversy. In poems such as his 1894 sonnet, “The Onondaga Madonna,” Scott presents his Indigenous subjects as noble, but “doomed.” The “noble savage” stereotype was one used by many of Scott’s contemporaries to romanticize Indigenous peoples as untamed but pure. Many late-20th- and early-21st-century writers, such as Northrop Frye, have noted the dark irony of Scott’s poetic sorrow for dying cultures that his own Department of Indian Affairs was actively eradicating, mainly through the residential school system. Having first joined the federal Department of Indian Affairs in 1879, Duncan Campbell Scott steadily rose through the ranks, and was appointed deputy superintendent in 1913, a position he held until 1932. In this role, Scott became the highest-ranking cabinet member on matters concerning Indigenous affairs, and played a central role in both Treaty 9 (also known as the James Bay Treaty) and the expansion of the residential school system. Many descendants of the Cree and Ojibwe signatories contend that their ancestors agreed to the treaty based on false pretences. They argue that the written text of Treaty 9 does not include all the protections and concessions that Scott and other government representatives had verbally promised. Treaty 9 First Nations maintain that they never relinquished their rights to traditional territory. Therefore, they argue, the government requires their consent before proceeding with any resource development or similar project on their land. In 1907, Dr. Peter Henderson Bryce, Canada’s Chief Medical Health Officer, submitted a report to the Department of Indian Affairs (commonly referred to as the Bryce Report, officially known as the Report on the Indian Schools of Manitoba and the North-West Territories), revealing that overcrowding and unsanitary living conditions were spreading disease, primarily tuberculosis, and that students were dying from it. Scott disregarded the report. In 1920, he changed the Indian Act to force Indigenous children between the ages of 7 and 15 to attend residential school. I want to get rid of the Indian problem. I do not think as a matter of fact, that this country ought to continuously protect a class of people who are able to stand alone. That is my whole point…Our object is to continue until there is not a single Indian in Canada that has not been absorbed into the body politic, and there is no Indian question, and no Indian department, that is the whole object of this Bill. Duncan Campbell Scott married American violinist Belle Warner Botsford in 1894. They had one daughter together, Elizabeth Scott, who died at the age of 12. After Belle’s death in 1929, he remarried two years later to poet Elise Aylen. Scott travelled extensively after his retirement, visiting various parts of Canada, the United States and Europe. Dragland, Stan, Duncan Campbell Scott and the Literature of Treaty 9 (1994). Stan Dragland, Duncan Campbell Scott and the Literature of Treaty 9 (1994).